Start Southwest end of Tahoe Meadows on Highway 431, 6.6 miles northeast of Highway 28 and 1.5 miles southwest of Mt. Rose Summit. End Highway 267, 0.5 mile north of Brockway summit. Park in the plowed area on the east side of the road. Without doubt, this tour along windswept, corniced ridges overlooking dazzling, blue Lake Tahoe is the preeminent “classic” tour in the Tahoe area. The trip starts at Tahoe Meadows on Mt. Rose Highway at 8,550 feet and ends at Brockway Summit at 7,000 feet. Ahhhhhh, a net elevation loss of 1,550 feet. Better yet, after quickly climbing to the tour’s highest point, the remainder of the tour is downhill with short climbs to the several peaks that are traversed. This tour surpasses the Sugar Bowl to Squaw Valley tour (not yet available in this guide) as the best all-around tour in the Lake Tahoe area because of the combination of terrain and scenery. However, the ridges in this tour, which make this a classic tour, are no place to be in foul weather. Pick a fair weather day so that you can enjoy both the skiing and the views. There is also one part of the tour that can be downright unsafe when icy or when snow conditions are unstable (see mileage log). Plan your trip accordingly. And while this tour can be done throughout the winter, the time required to complete the tour makes spring the optimum time. From the trailhead (1) ski west and descend for a total of 0.5 mile until you reach Third Creek (2). Cross Third Creek and ascend west, at first on a broad shoulder, for at total of 0.9 mile until you reach a broad saddle (3) located between rocky Peak 9773 and Peak 9561. These two peaks are visible from the starting point. 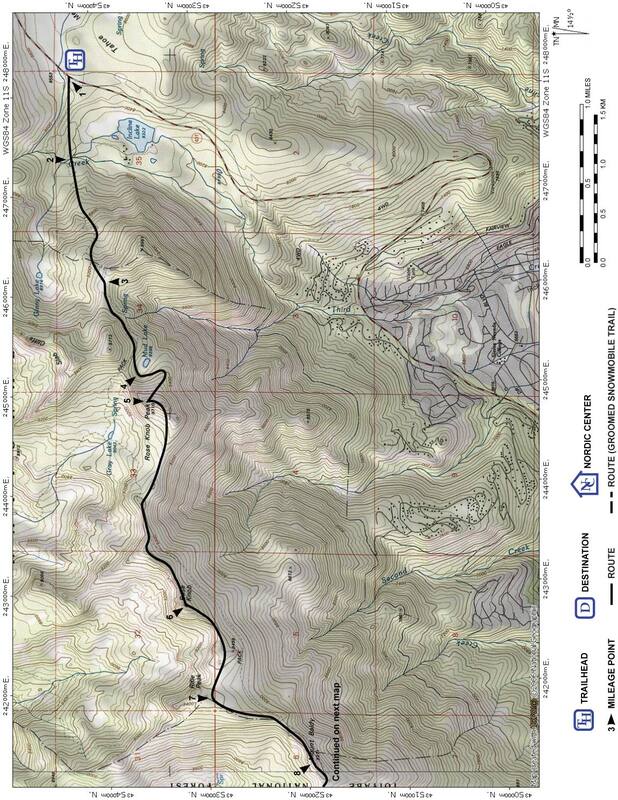 Traverse around the south side of Peak 9773 for 0.6 mile until you reach a location north and slightly above Mud Lake (4). Start the traverse very close to Peak 9773. There is a sign pointing up the peak at Sullivan Chute — definitely only for crazies. Caution — the traverse is across a steep slope that is not safe when icy or when snow conditions are unstable. Climb south onto a ridge and then ascend the ridge northwest for a total of 0.4 mile until you reach Rose Knob Peak (5). Ski west along a ridge for 1.6 miles until you reach Rose Knob (6). Ski southwest and then west along a ridge, past Peak 9499, for a total of 0.7 mile until you reach the location where the ridge forks (7). Rifle Peak is nearby to the north. Ski along the ridge that heads southwest (left fork) for 0.8 mile until you reach Mt. Baldy (8). Descend southwest along the ridge for 0.1 mile and then descend northwest (right) along the ridge for 1.4 miles until you reach the southeast side of a small knob (9). Ski around the south side of the knob for 0.4 mile until you reach a saddle to the east of Martis Peak (10). Climb west at a steep angle for 0.3 mile until you reach the summit of Martis Peak (11). 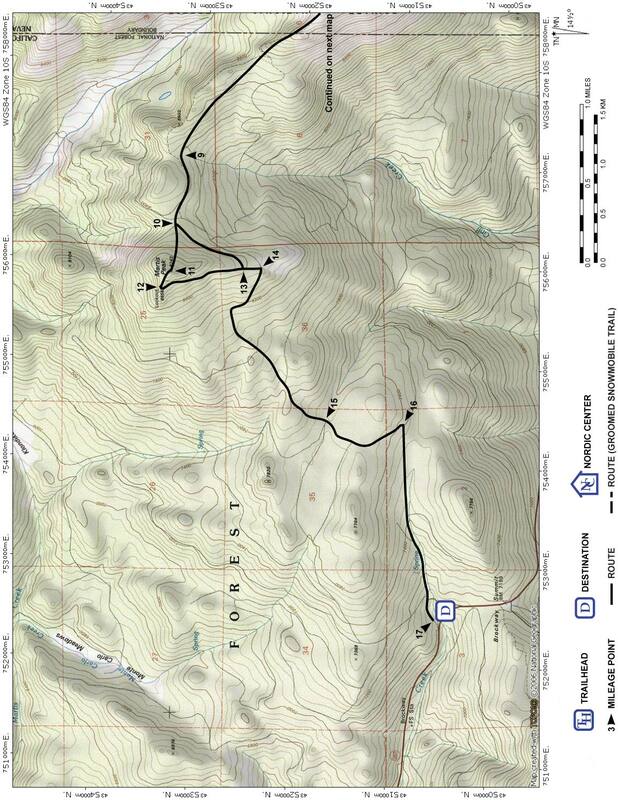 A shorter and less steep alternate route is to traverse southwest and intersect Martis Peak’s south ridge and the main route at mileage point 13. This is a good choice if you are tired and/or running out of daylight. Descend northwest for 0.1 mile until you reach the Martis Peak Lookout (12) where you should find a road . Ski south on the road for 0.7 mile until you reach a road junction (14) on Martis Peak’s south ridge. From here to the end of the tour you will be on a road well used by skiers and snowshoers. Although snowmobile traffic is not heavy, you are likely to find the road tracked by them. Turn west (right) and follow the road for 1.3 miles until you reach a flat area (15) where several roads connect and a drainage descends southeast. Continue to follow the main road south (straight) for 0.6 mile until you reach a road junction (16). Turn west (sharp right) and descend on the road for 1.3 miles until you reach the Highway 267 (17).